Rock goddess/poet Patti Smith doesn’t look like she spends much time worrying about her next meal. I imagine she eats for fuel and doesn’t make a fuss. She’s all rangy and sinewy, giving off an air of wiry strength as though she regularly chops logs with an axe. However, when she opened the Green Man festival last week with a belter of a set, she surprised us all, making a special mention of how much she loved the food on offer: “The rotisserie chicken and potatoes from that stall are really really great, and they come with nice potatoes,” she said, in between songs and rapturous applause. We held our breath. Wow. The great lady of rock EATS and EATS WELL. 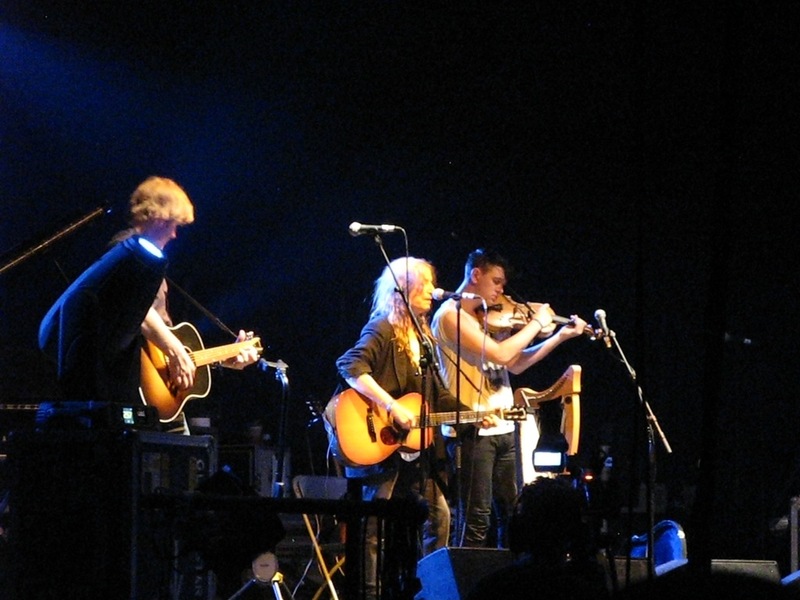 And her son was playing a harp beside her onstage. I think at that point everyone wanted Patti to be their mum. 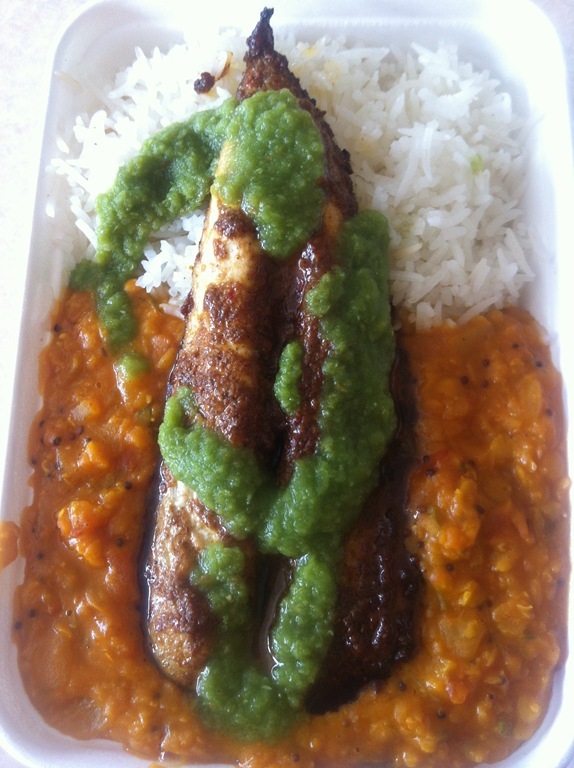 3: The Goan Seafood Company: spiced mackerel fillet served with basmati rice and dhal. This is the dish to make you feel human again after a day subsisting on chips, ice cream and ales. It’s light and aromatic, and the fish is super fresh – no mean feat to be serving this up in the middle of a field in the Brecon Beacons. The lentil dhal is creamy and full of lovely mellow spices, and the homemade green spicy chilli sauce gives everything a lovely kick. 2. 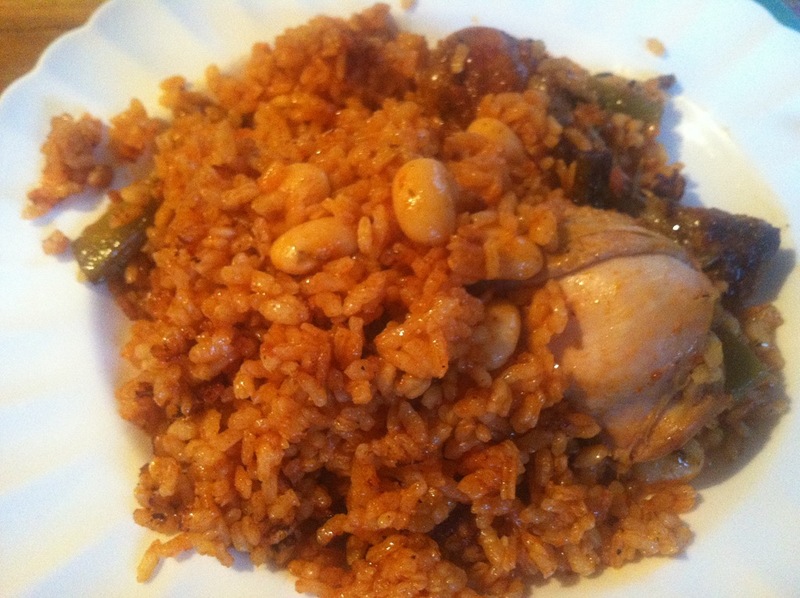 Jamon Jamon: Paella Valenciana – chicken paella with green and butter beans and saffron. I know the photo doesn’t do it justice, as I just tipped it out onto a plate, but the Jamon Jamon boys really know how to cook a paella with attitude. The rice is chewy and savoury, with lovely crunchy bits from the bottom of the paella pan mixed in. The chicken is a generous meaty hunk of thigh, and the green and butter beans provide a welcome bit of texture. Everything on the plate is so savoury and moreish, you can tell they use a really good chicken stock. It’s the ideal dish to scoff when you’re feeling a bit festivalled-out and ragged. Argh, I want some now. Do they do mail order? 1. 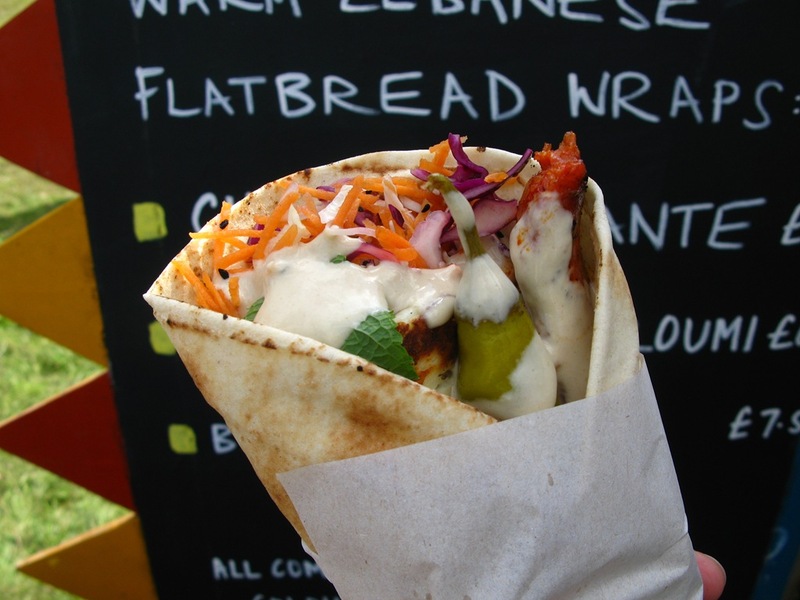 French and Grace: chorizo and halloumi ‘uber’ wrap: this was my absolute FAVOURITE thing to eat at the festival. Doesn’t it look enticing? 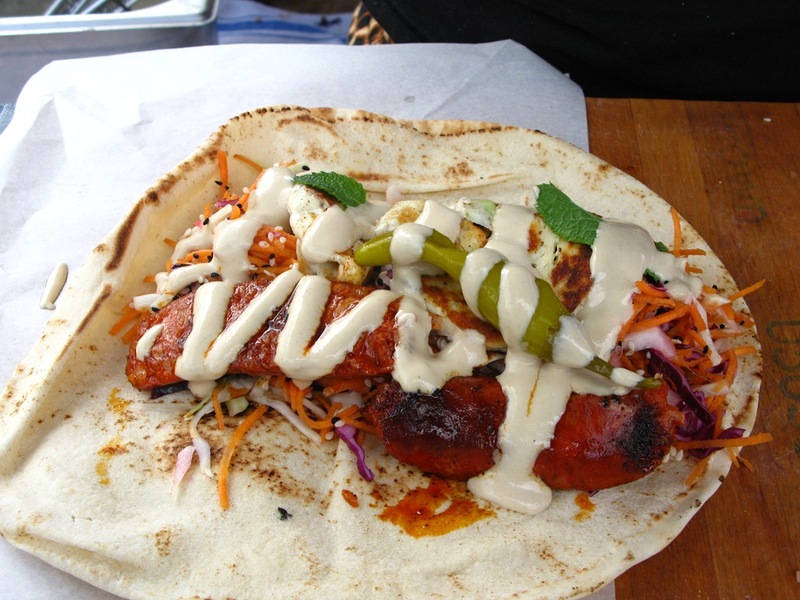 A warm Lebanese flatbread wrapped round juicy chorizo sausage and halloumi cheese wedges, with shredded carrot and cabbage salad, pickled chilli, mint and tahini sauce. Simply awesome. I could eat one of these every day. And the girls who run the stall, Rosie and Ellie, are super nice and I am slightly in awe of them. Their story goes as follows: they ran a supperclub (Salad Club) from their flat in Brixton, which led them to opening a wee restaurant in Brixton Village, then they published a cookbook and are now opening a second restaurant in Camden. Awesome ladypower! Not exactly a ‘top three’, but I can’t fail to mention the stall I always stumble to in the early hours of the morning, to have a second dinner. La Grande Bouffe serve the most dirty (I mean that in a good way) pancakes full of butter and cheese, and even though the mushrooms and spinach come out of tins and the ham is really scary and cheap looking, I don’t care because it tastes filthy good. The French owner is charmingly rotund and jolly. You’d have to be, to sell food like that all day long. She also makes artery-clogging tartiflette (potatoes with lardons, cream and cheese) and Toulouse sausage stews in giant pans. I wonder if she has a defibrillator tucked away next to the butter and Nutella stash. I salute these festival stalwarts – they have been at almost all the festivals I’ve attended since I was a teenager, and their dirty crepes have staved off many a lethal hangover. 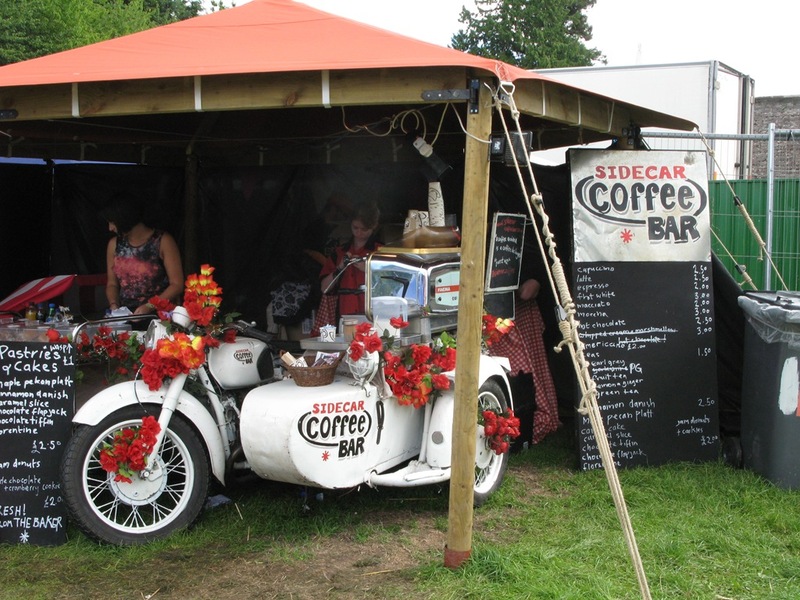 And look at these guys serving coffee from their cute sidecar – I never tried the coffee because I always arrived at the wrong moment and the coffee machine would still be heating up, but the stall looks fab don’tcha think? 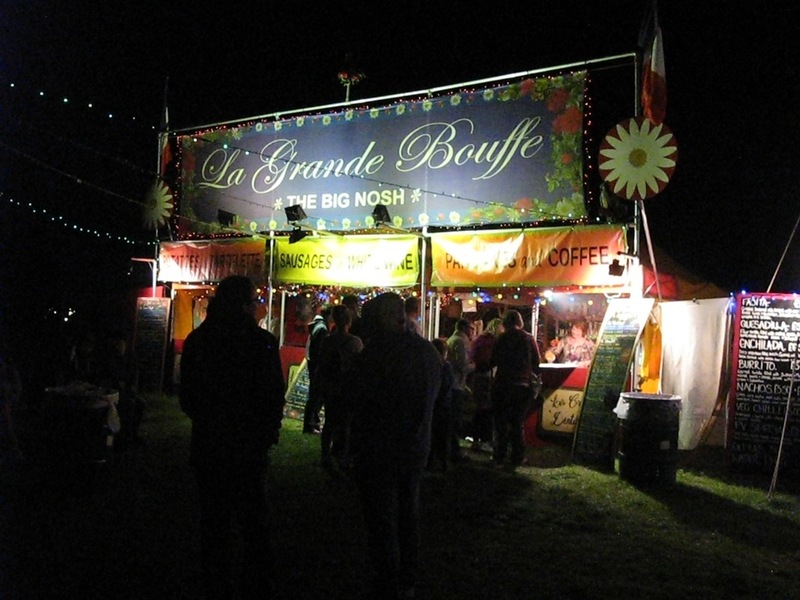 Anyone out there got any festival food memories they’d like to share? Eaten anything delicious or downright dirty? Hippy chippy chips and cheese with lots of vinegar! Late night dirty scrum! Hell yes, Al! I had some of these chips too. They have a curiously addictive coating…msg? I don’t care, they were lovely! the chips from Hippie Chippy at greenman were amazing! even though they may have been £3.50 for a small box they were well worth it mmm, hippie chippy craving right now! Right on, Joanne. The portions were enormous and great value. Go Hippy Chippy! I am also expressing support for happy hippy chips, best festival chips I have ever had and I’ve eaten a fair few! I really liked the veggie mexican stall, epic nachos and gorgeous quesidillas. The vegetarian and vegan burger stall was also great, loved putting lots of chilli auce and garlic mayo on my burger, yum yum! The ice cream was amazing especially the peanut butter and chocolate flavour! Roll on next year for more great eats! I’m drooooling. I couldn’t agree more about the paella from Jamon Jamon. I still remember the taste of the chicken paella I ate in 2012. This year, I breached out and had their seafood one – delicious. I also had an excellent bacon-and-egg sandwich and a coffee from their stall. The owner was efficient and full o’ banter. My Dad was raving about the lamb wrap he had, near the main stage. 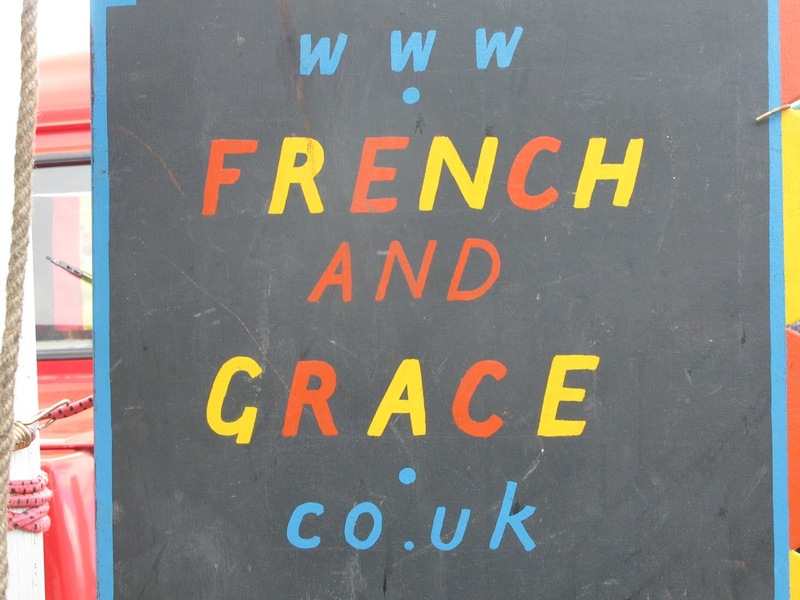 Would that have been from French and Grace too? And I also heard that another friend had, like, three of those chorizo wraps over the weekend – he needs a loyalty card. Had a delicious burrito from the Mexican place up near the ferris wheel. I was so tired that the burrito felt like a life-giving force rather than just food. My other Green Man festival MUST is a bag of hot, crunchy, soft cinnamon donuts from the stall in the courtyard. They remind me of childhood because my tiny, rural primary school used to have a bi-annual fundraiser called ‘donut day’ when the mothers (it was always mothers) would hire a donut machine and sell hot fresh donuts from the canteen to raise money for the P&C Association. OH YES! Also scoffed a box of chips from the Hippy Chippie. Hey Pip, wow, yes, of course – those cinnamon donuts are amazing. I have eaten many of those when I get too tired to walk in a straight line! And am devastated that there weren’t enough days of the festival for me to have a proper Mexicano blowout at the burrito stall. I wanted to eat about 9 meals a day! 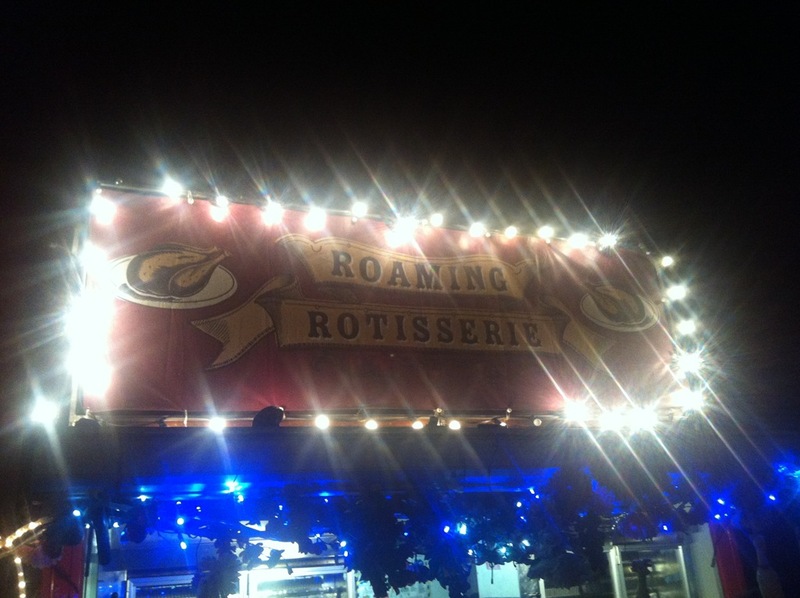 Never got to eat at the Roaming Rotisserie (which is excellent) because I needed a separate stomach…sad…I would kill for some paella right now, though. Jamon Jamon do you do delivery??? I agree re: French & Hrace in particular! Scrumptious!! Could you check out another little cafe for me next time please? It’s run solely by volunteers from 6 charities local to Crickhowell, & the food is sourced locally too from the two butchers in Crickhowell … Plus it’s open 24 hours, and a the cakes are baked locally and donated by the locals! All proceeds go to helping local children and their communities, ranging from sports or musical equipment, to keeping the local Eisteddfod going!